The Raelian Movement, one of the world's most fearlessly individualistic philosophies of love, peace, and non-conformism: a beautiful combination of spirituality, sensuality, and science, counting 60,000 members in 84 countries... (www.rael.org). In this Philosophy, a Human's ultimate dream of eternal life, which past religions only promised after death in a mythical paradise, will become a scientific reality. RAEL, with exceptional vision allows us an extraordinary glimpse into an amazing future and explains how our nascent technology will revolutionize our world and transform our lives. For example, he describes how nanotechnology will make agriculture and heavy industry redundant, how super-artificial intelligence will quickly outstrip human intelligence, how eternal life will be possible in a computer without the need for any biological body and much, much more. As RAEL says, don’t make the mistake in thinking that this is twenty second-century science fiction. All this could happen within the next 20years! At the age of twenty-seven, Claude Rael was ambitious young motor racing driver. He had already won a dozen trophies and founded a successful motor sport magazine…. But on 13th December 1973, his life changed dramatically. 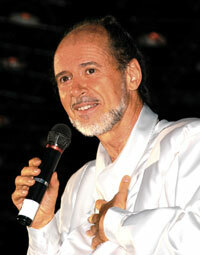 He founded the International Raelian Movement, a non-profit making organisation, to spread this information and to build an embassy for the landing. Since the mid-Seventies he has devoted his life to travelling the world, lecturing, broadcasting and writing about this claimed truth.